Viola Powell, 82, of Independence, MO, formerly of Lincoln, MO, passed away Monday, October 15, 2018. A visitation will be held from 9-10am on Saturday, October 20, 2018 at Carson-Speaks Chapel 1501 W. Lexington Ave, Independence, MO, 64052. A service will follow at 10am at the chapel. She will be laid to rest at Mission Ridge Cemetery in Louisburg, MO at 3pm that afternoon. Viola was born on January 20, 1936 in Kansas City, MO to Carl Cox and Katrina Sharitz. She grew up in Urbana, MO but returned to Kansas City at the age of 15 to find a job. It was there where she met Billy Hardison. They were married on November 15, 1952 and together they lived in Independence, MO and raised 6 children. He passed away in 1979, after 27 years of marriage. Viola worked several jobs including Lake City Ammunition Plant, Helzberg Diamonds, AT&T, and Washington Inventory Service - where she met her second husband, Mack Powell. They moved to Lincoln, MO and were married 25 years. In her spare time, Viola loved to hunt, fish, camp, garden, quilt, and sew. 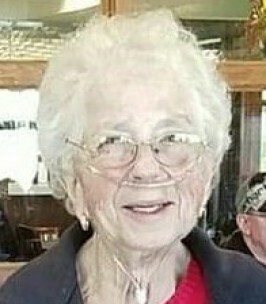 She was a member of the Garden Club in Lincoln, MO – where she was Master Gardener and would be featured on radio shows, Warsaw Elk’s Club, and was ranked Queen at Top’s Weight Loss. She will be remembered by her son Mike Hardison and wife Rhonda of Independence, MO; daughters Patty Anderson and husband Dean of Quincy, MO, Cynthia Hardison-Summers of Independence, MO, Diane Smith and husband Steve of Independence, MO, Malissa Turpin and husband Alan of Independence, KS; step-son Todd Powell and wife Vicki of Cabool, MO; step-daughter Alisa Buck and husband William of Maryland; 14 grandchildren; many, many great-grandchildren; plus several nieces, nephews, and other extended family members. She was preceded in death by her first husband Billy Hardison in 1979, son Steven Hardison in 1981, second husband Mack Powell in 2013; and all 7 of her siblings. The family suggests that memorial contributions be made to Mission Ridge Cemetery. To plant a tree in memory of Viola Mae Powell (Cox), please visit our Heartfelt Sympathies Store.